Temperature Gauge is a neat little app that logs the temperature from every sensor in any Mac. 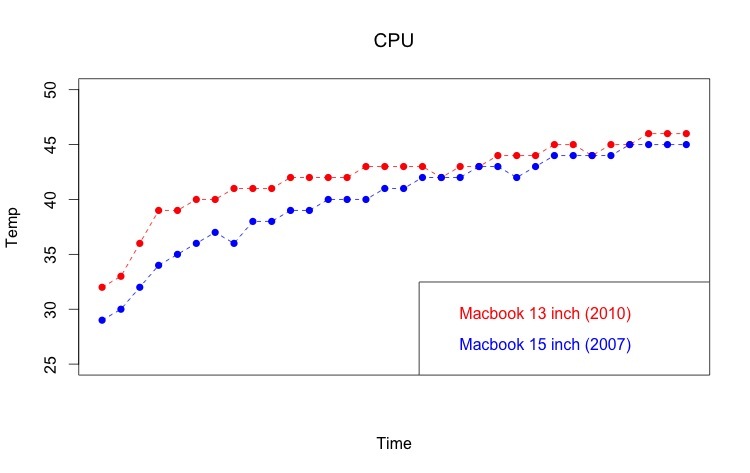 From around 2007, Apple has continued to include a bewildering number of these sensors, but I'm just going to look at a single example that can be found on any computer - The CPU. Taking an iMac from 2013 (quad-core Intel Core i5) and a 13 inch Macbook Pro from 2010 (Intel Core 2 Duo), I compared their temperatures from switch on. After the operating system was loaded, each computer played a standard definition video lasting 5 minutes. 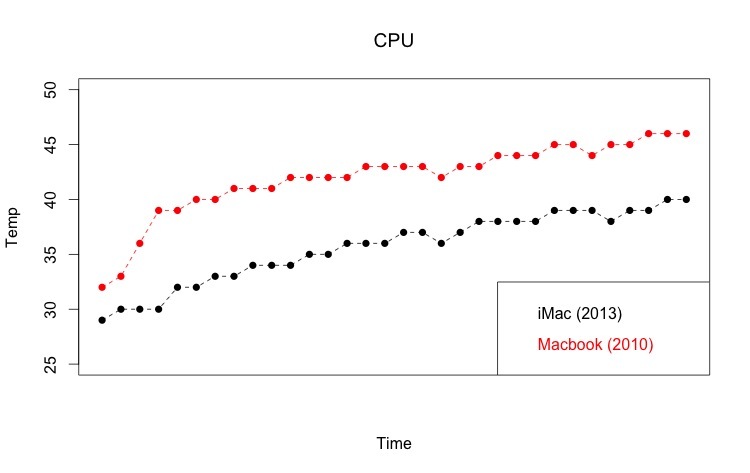 To keep things as controlled as possible, both computers were running the same version of Mac OS X and were tested at the same time in the same room to keep the ambient temperature constant. The fans in each machine were kept at a fixed rate using smcFanControl. As expected, the iMac consistently runs at a reduced temperature because it contains a more efficient processor and provides more volume for air to circulate. What you might not expect is how the two processors respond over time as the general trends are almost identical in terms of how the temperature rises and falls at specific points in time. I also managed to get my hands on a 15 inch Macbook Pro from 2007 and ran the same test. Again, the general trends were similar, but a larger laptop, despite being several years older and running a rather outdated version of the Intel Core 2 Due, ran consistently cooler. 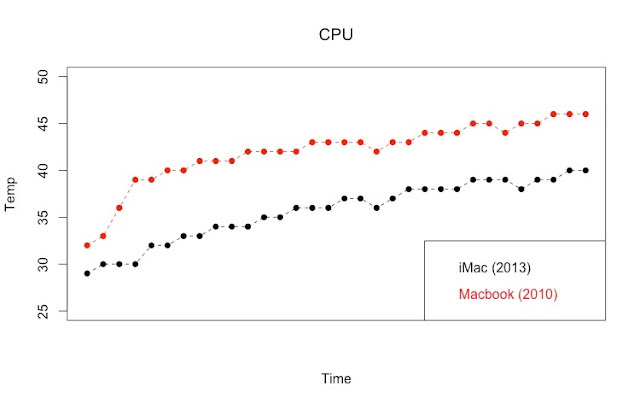 Breathing space appears to be the most important variable**, but I wonder how this affects the lifespan of the CPU. Does a larger Macbook Pro last longer because it consistently runs at a lower temperature? *Two laptops serve as a better comparison because they utilise fans of identical size. ** I should also add that the insides of all three machines were cleaned to ensure that a build up of dust inside would not influence the results.